Athena is the Greek goddess of war, wisdom, justice, and industry. 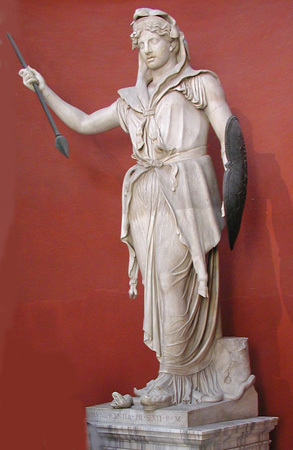 Athena�s companion was Nike, the goddess of victory. Her attribute was the owl, and she was the bearer of the Aegis. Athena was the daughter of Zeus and Metis, goddess of wisdom. According to legend, Metis was to bear a son greater than Zeus. In fear, Zeus swallowed Metis to ensure that no one mightier than himself would exist. Inside Zeus� stomach, Metis began to hammer a helmet and a robe for the baby that she was expecting, Athena. The hammering, however, caused great pain to Zeus, and so he called his son, Hephaestus, for help. Hephaestus split open Zeus� skull from where Athena emerged fully grown, dressed in the robe and helmed that her mother made for her. According to legend, Athena and her uncle Poseidon both wanted to attain a city in Greece that topped the Acropolis. In order to decide which one of the two would gain possession of the city, Athena and Poseidon began a contest. The contest comprised of who would present a better gift to the city and its citizens. Poseidon awed the people with a spring, but the water that sprung from it was as salty as the sea and was undrinkable. Athena, in turn, gave the city an olive tree. The olive tree was very precious to the people because it provided them with food, oil, and wood. Since Athena�s present was the finer one she gained possession of the city and named it after herself, Athens.